9/65 Kim Hollis Moulin Rouge! for penguins with just a touch of Footloose. Clever, marvelously animated, and super-fun. 14/159 David Mumpower Absolutely adorable penguin romcom has the laughs Cars lacks but it doesn't quite have the soul. 158/200 Max Braden This turned into an uneasy, surreal mix of pointless cute and grim reality. If we have learned nothing else from animation and trips to zoos with children, it's that penguins are some of the most entertaining and fascinating creatures in the world. From Tennessee Tuxedo to Feathers McGraw to the evil little penguins in Madagascar, we've seen time and time again that these natural tuxedo wearers lend themselves naturally to funny stories. Warner Bros. finds themselves jumping into the CGI animation fray as they release this movie set in Antarctica. The family-centered story will take viewers right into the midst of a group of Emperor Penguins. In this group-think society, the penguins find their soul mates through song. Imagine how awful it would be to be the only penguin in this world without the ability to sing. Why, it would probably be like living as Rudolph the Red-Nosed Reindeer, ostracized from the reindeer games! Such is the case for a young penguin named Mumble (Elijah Wood). Although other penguins such as Gloria (Brittany Murphy) have beautiful voices, Mumbles has no ability to sing whatsoever. On the other hand, he can certainly tap dance. Might this talent be his avenue to finding acceptance and singularity? 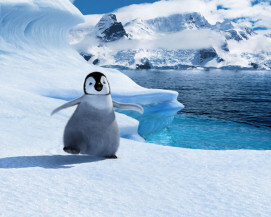 See the latest developments for this project on the Happy Feet Movie News page.